After releasing Rigid Polyurethane (RPU), the next CLIP material to go out of our Pilot Program is the expected Elastomeric Polyurethane CLIP Resin (EPU). After uploading your design on our website, you can now choose, directly from the list of materials, the CLIP EPU Material and start 3D printing your stretchable object. When Carbon released its CLIP array of materials, we were very excited here at Sculpteo to show you that whole new range of possibilities with these new resins. We first launched our Pilot Program in beta testing, where it was available for users who could explain a specific project, before progressively making it accessible for everyone. That day finally arrived and you can now choose the CLIP Carbon EPU Resin! CLIP (Continuous Liquid Interface Production) technology, thanks to its continuous 3D printing process, allows us to print with a layer thickness of 100 µm or 0.1 mm which are almost invisible. Parts are then very close to injection molded models, which makes it very interesting for prototyping. Elastomeric Polyurethane CLIP Resin, due to its high performance allows excellent elastic behavior under cyclic tensile and compressive loads. You can stretch it and bend it, it takes back its original printed shape. 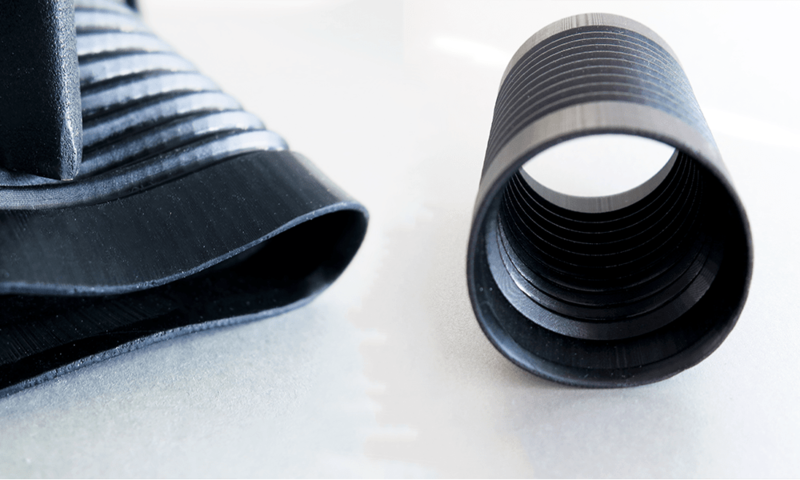 The material is especially designed for gaskets, grommets, and flexible watertight seals. EPU resin is rubbery, resistant, flexible and stretchable. You can find more informations and guidelines on the CLIP EPU Resin page. If you feel interested by Carbon CLIP technologies, you can subscribe to our newsletter and be told when a new material is released.